brewed in the Czech Republic. After touching down in Munich, Germany, just a couple of days ago we are now on the road again … jetlag and all! We left the historic village of Freising yesterday afternoon and drove through the Bavarian Forest enroute to our destination of the Czech Republic. The only brief stop was in the quaint village of Furth near the German/Czech Republic border to buy some of the best cold meats (wurst) in Bavaria then it was on to the border where it seemed like the guards had their first encounter with a Kiwi and didn’t quite know how to deal with it. Once through the border control, we set off again this time through the Bohemian Forest, then past roadside stalls, and over beautiful rolling countryside. There were a few signs of remnants from the communist times but in general the country is being rebuilt and tidied up. 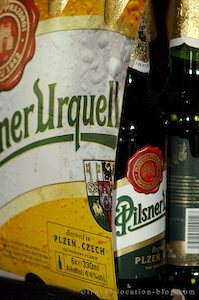 We pass through the town of Pilsen which is famous for its beer - Pilsner Urquell, and a fact that some people may not know is that Budweiser beer actually comes from the Czech Republic (and yes we can confirm - it is awesome beer). Since we are on a mission to get to our destination today, we don't stop for any sampling, but make a note to allow sufficient time on our next visit in Bohemia.